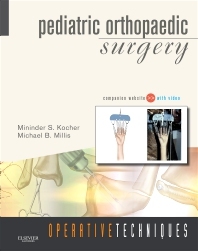 Pediatric Orthopaedic Surgery—a title in the Operative Techniques series—offers you the step-by-step guidance you need—on femoral lengthening, sofield procedure, distal radius fracture, and more—from experts Mininder Kocher and Michael B. Millis. Perform all of the latest and best techniques in this specialty thanks to large, full-color intraoperative photos, diagrammable illustrations, and a state-of-the-art companion website, which includes procedural videos. The complete, lavishly illustrated volume is made even better with a state-of-the-art companion website, which includes procedural video! Refine the quality of your technique and learn the expert’s approach to getting the best results thanks to pearls and pitfalls and an emphasis on optimizing outcomes. Master every procedure with step-by-step instructions on positioning, exposures, instrumentation, and implants. Provide comprehensive care for your patients through discussions of post-operative care and expected outcomes, including potential complications and brief notes on controversies and supporting evidence. See every detail with clarity using color photos and illustrations that highlight key anatomies and diagrams that present cases as they appear in real life. Watch experts perform key techniques in the online video library.